The Tucson Ronald McDonald House is conveniently located at 2155 E. Allen Rd., Tucson, AZ 85719. We are close to most area hospitals and, with free shuttle service, we make getting around safe and easy. 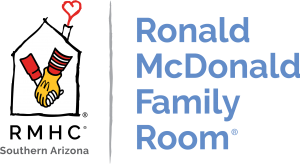 The Ronald McDonald Family Room is located on the 4th floor of the Banner Children’s Diamond Children’s Medical Center.